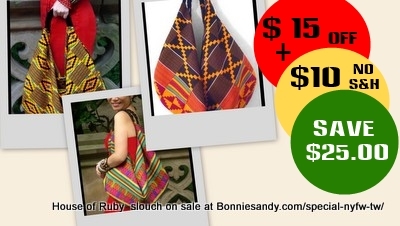 These African print Slouch bags from Designer Tenneh Wilkins of House of Ruby are still available but at their regular price… See bag details below button. This is a direct offer from the designer you will be taken directly to the designers paypal checkout page. Stock up on these African Print Slouch bags for a GREAT reason to shop! Tenneh Wilkins is a women’s wear fashion designer who utilizes fashion to pay homage to world culture. She spent her childhood years in her parent’s native country Monrovia, Liberia. There she watched her jet-setting mother adorn herself in exotic West African robes, Moroccan fabrics and European fashions. She emulated her mother through crayon illustrations of lavishly ornamented dresses. Her mother and socialite Aunt Rubitha inspired the name “House of Rubi”. Tenneh’s ultimate goals are to travel around the world, capture creativity and utilize her fashion brand to share her discoveries with everyone! She also will create a school of arts in her parents’ homeland, Monrovia, Liberia. Tenneh lives by her motto ”Culture, Confidence, Creativity”. Yes you read right! You’re not shopping you’re funding- These offers help the very talented put their collection into production! So what if you save in the process! I guarantee that each designer is leveraging her skill to grow their business. I curate and select the best as well as work with them in bringing their new ideas to market! Posted in Uncategorized and tagged Creative Specials, Creative specials, Tenneh Wilkins.